Madrid: Atletico’s relocation delayed further? The required works include road exits from the A-2 and M-40 motorways; projects that had been previously agreed with the Ministry of Public Works to be put in place in time for the opening of the new arena. Other planned infrastructure projects, such as the extension of the M-40 service road to connect it with the M-14 and the M-21, have been labeled as “impossible” to meet the September deadline. The Madrid City Council aims to avoid congestion problems around the ground via a sustainable mobility plan that seeks to promote access to the stadium by public transport. Spokesperson for the Sustainable Urban Development (DUS) Commission, Mercedes González, stated that as time runs out "the abyss" draws closer as access to the stadium is not ready, and that a "historic comeback” is needed for the works to completed before the start of La Liga 2017-18 season. Wanda Metropolitano, the new stadium of Atletico in eastern Madrid, has been under construction for the last 6 years. Redevelopment from a 25,000-seat athletic stadium into a nearly-70,000 football venue has been marred by delays from the start, having been scheduled for opening in 2014, 2015, 2016 and now 2017. 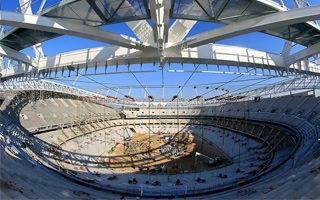 Extremely sensitive operation of the cable roof lifting into place has been completed this week, allowing pieces of membrane to be installed on top of the stadium. There will be a total of 720 PTFE segments installed, each with translucency of 35% to ensure natural light access during the day. The roof is a result of multi-national cooperation, beginning from Cruz y Ortiz Arquitectos (Spain), through Schlaich Bergermann und Partner, Verseidag, Montage Service (Germany), Maffeis Engineering (Italy) to Taiyo (Germany/China), who deliver the membrane itself and are its main contractor. Overall there will be 83,000 m2 of membrane used, but despite this large surface total weight of the roof should be reasonable, 6,300 with the main compression ring included.